The Brennan brothers, Gary (left) and Shane (right). 12 YEARS OPERATING in the engine room for the Clare footballers may start to cause wear and tear but Gary Brennan checks himself if ever he’s thinking the schedule is becoming too hectic. A lynchpin of the Clare team for over a decade, Brennan has been joined in the Banner setup by his brother Shane in recent years. Last June in Ennis, Shane started at wing-forward in the Munster semi-final against Kerry but his progress was seriously derailed in that game. “Shane has had huge misfortune. Just the one injury problem since the Kerry game in championship last year,” said Gary. “He was just going for a ball, reached out and someone stood on his foot. He had a Lisfranc fracture, did serious damage to a ligament in his foot and has been out of action since basically. “(He) missed our club campaign and missed all the county campaign last year. He tried to come back, we were in the county final with the club and he played the county final but under a lot of pain. “He’s facing another surgery now. So whenever I might be feeling a bit sorry for myself to go training, not that it happens that often in fairness, you only have to look at Shane, he’d love to be playing and he just can’t at the moment. 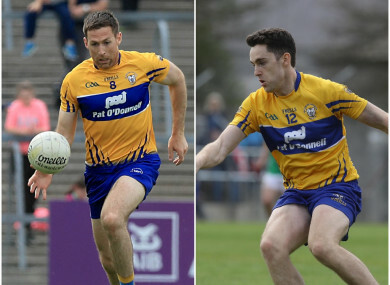 Shane’s absence has coincided with the arrival of another younger Brennan sibling into the Clare ranks, Cillian nailing down a berth for himself in the inside rearguard this spring. “(It’s) his first year on the senior panel,” said Gary. “He was with us last year, training to get a bit of experience and that. He’s burst onto that and mad for action. He’s turned himself into a back, he was always a forward in his younger days. “But he had some good performances in the backs for us in club championship last year so he’s filled in at full back for a lot of the league. Listen he’s a very good attitude. He’s eager to learn and eager to work hard. The real test will come in championship and I’ve no doubt he’ll be well ready or well eager to battle for them as will many of those young guys. Brennan has been able to put all his energies into the Clare footballers this season after juggling their campaign with Ballyea’s memorable club hurling run in the winter of 2016 and spring of 2017. He had a couple of frantic weekends serving both masters but while Brennan’s commitment may have seemed fascinating from the outside, he found it a simple choice to make. “It was very balanced until we won the All Ireland semi-final in the hurling. Then it got tough. I played a couple of football games, but picked up a knock actually in the second round of the football league playing Down at home. That complicated things a little bit. “I suppose it was just about trying to balance it, but there were two very busy weekends the All Ireland final and semi-final. I wouldn’t swap it. “To get the opportunity to play in an All Ireland club final, I wasn’t going to turn that down and equally I wanted to play in Division Two with Clare. Brennan is keen to seize the opportunities placed before Clare footballers at present. After their maiden voyage to the All-Ireland quarter-final stage in 2016, they have consolidated their status in the second tier of the league for the past two campaigns. The St Patrick’s Day win away to Cork stood out. “It is nice and definitely better to be at that end of the table than to be maybe out of contention or hoping you might get out of Division Four. It is progress, but as we are developing and start getting up those leagues you start getting greedy. In terms of what we took out of it we blooded a lot of new players. “I’ve taken a few trimmings from them (Cork), that is for sure. It was a great result for us. I wasn’t involved in the game last year because I was with Ballyea at the time so it was my first time beating Cork. Clare’s development has been masterminded by Colm Collins. His intelligent stewardship has left them in a good place as Saturday night’s Munster opener against Limerick in the Gaelic Grounds beckons. The retention of the services of Collins was crucial in the eyes of Brennan. “It is hugely important. Colm has put a great structure in place. Guys have bought into it, he knows the county and he knows the players well. “Colm, I don’t know whether he is planning on being an Arsene Wenger or a Brian Cody about it, but as long as he wants it at the moment, he is more than welcome to have that job. Email “Clare's Gary Brennan - 'You only have to look at Shane, he'd love to be playing and he just can't at the moment'”. Feedback on “Clare's Gary Brennan - 'You only have to look at Shane, he'd love to be playing and he just can't at the moment'”.